You have never seen that before!!! We would like to invite you to the ball-rooms located 125 meters deep in the earth. They are as gloomy and mysterious as Hades's kingdom but at the same time they are full of magic and give you the thrill of excitement. Surrounded by thousands of crystals, you will feel like in a fairy-tale. This scenery together with your dancing and Latin music will be something extraordinary! Come to us and let your body control your mind!! Along with us take a part in this unforgettable dancing adventure, which has been announced the event of the year!! The best salsa instructors, excellent DJs and amazing atmosphere of the place will guarantee you an unforgettable experience. Remember!!! Crystal Salsa Party is something unprecedented!!! IV International Crystal Salsa Festival was an amazing salsa event! The best artists of salsa scene with dancers from Frankie Martinez & Abakua Dance Company at the head, all night parties and workshop at the highest level! Despite overall satisfaction and a large number of participants after IV Crystal Salsa Festival it seemed that Fifth Anniversary Edition of Crystal Salsa Festival wouldn’t take place. But fortunately we've won over new business partner – KEY, company which is present on Polish and European market for many years. Thanks to this cooperation we are able to organize V International KEY SALSA FESTIVAL in Salt Mine in Wieliczka and also this year you’ll enjoy during the best salsa event of the year! The best artists, including Frankie Martinez and Abakua Dance Company, amazing salsa parties 125 meters under the earth and a lot of workshops DO NOT be missed! We guarantee that, despite the name change the quality of our festival will not change… and if that happens, it just got better! We would like to invite you all 9th – 11th September 2011 for a unique salsa congress. Let’s celebrate with us our 5th Anniversary! We promise a lot of attractions, unforgettable contests, amazing emotion and everything that indicated a high level of Crystal, and which will also become a force KEY SALSA FESTIVAL. wow!! i've been to Krakov once and to Wieliczka! It's out of this world! But i never knew you could organize such a massive salsa festival there! The video alone makes me wanna go there again! Btw what does KEY stand for? i know it's a salt mine, it's gorgeous! but claustrophobia is the fear of closed spaces and i'm prone to that. 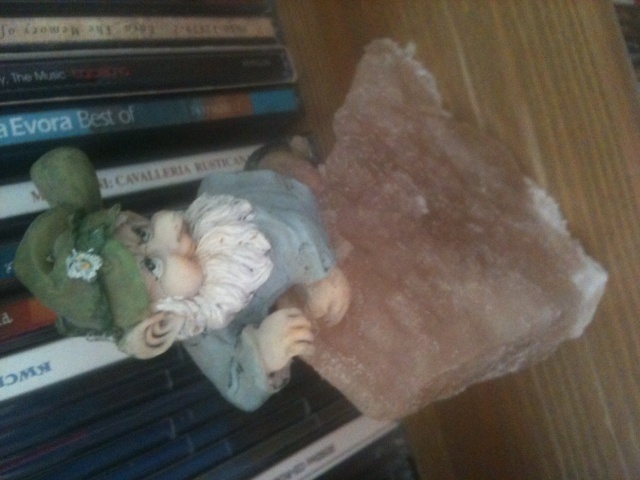 Here's a salt stone i got from that place! For a fifth time we would like to invite you to the ball-rooms located 125 metres deep in the earth. They are as gloomy and mysterio us as Hades's kingdom but at the same time they are full of magic and give you the thrill of excitement. Surrounded by thousands of crystals, you will feel like in a fairy-tale.This scenery together with your dancing and latin music will be something extraordinary !!! This year, during the festival, everyone will find something for himself! We will organize classes of all salsa styles: LA, mambo, cubana. Also bachata, kizomba, zouk, rumba and cha-cha-cha will not be missed! Check the schedule on our website! You are supposed to participate in 4 salsa parties, in 60 hours of workshop on diffrent dificulty level, in dancing spectacles with participation of world famous salsa stars. For the SECOND time on a Polish salsa scene you will have a chance to see Frankie Martinez & ABAKUA Dance Company, straight from New York City at opening of the 5th KEY Salsa Festival on September 9th 2011. In two days the best salsa artists from all over the world will show you how to listen and interpret Latin music, sounds and rythym for showing what is the most beautiful! Come and let your body control your mind. Join us and take a part in this unforgettable dance adventure which has been announced the event of the year!